Amazon Crime Author Mick Rose pens haiku and prose, while wandering the U.S. in a Quest for the Perfect Pizza. While his crime fiction can loom dark, and not for the faint-of-heart, he typically tells tall tales involving sexual humor (which sometimes prove explicit). Mick's 5,000-word suspense thriller, "The Friend Request is featured in the Dec. 2018 issue The Anthology of Human Thought from Introvert Press. Meanwhile his haiku graciously appear in the Sept. 2018 issue of Better Than Starbucks poetry magazine, and the poetry collection Yearnings by Filipino poet Ayo "Carolyn Abanggan" Gutierrez. ​Mr. 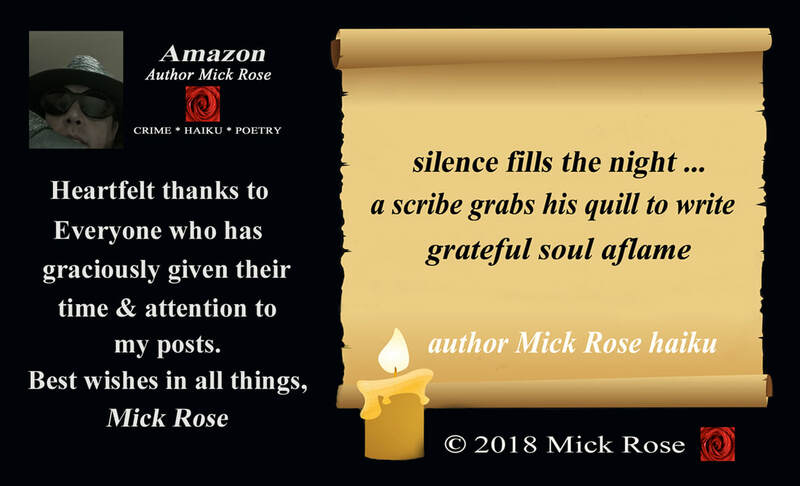 Rose is grateful to his publishers Josh Jones, Introvert Press; Anthony Watkins, Better Than Starbucks; Ayo Gutierrez, Abanggan Books; Poet John Patrick Robbins, The Rye Whiskey Review and Under The Bleachers; Craig Douglas, Close To The Bone; Cindy Rosmus, Yellow Mama Webzine; A.M. Stickel, Black Petals; and the dynamic duo Arthur Graham and India LaPlace, Horror, Sleaze, Trash.